The Caracciolo-class is one of the many designs made by Rear Admiral Ferrati before the start of WWI. 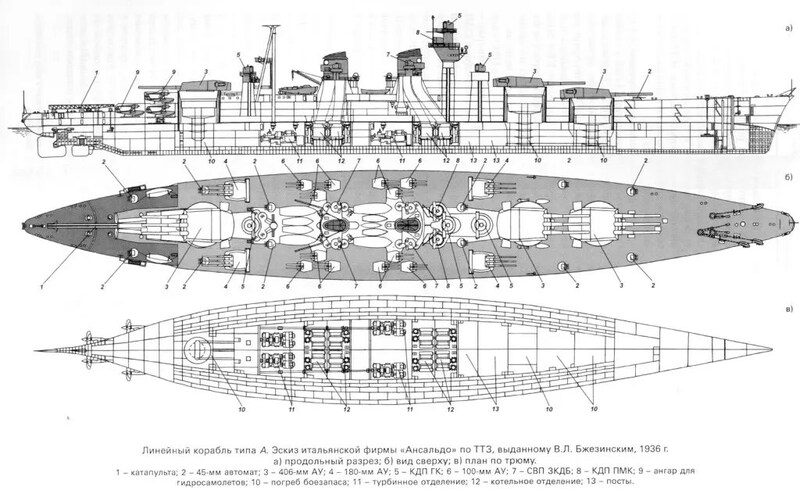 Compared to the other designs, characterized by the main armament placed in quad mounts(with either two, three or four mounts each), this class is more conventional and similar to British super dreadnoughts such as the Queen Elisabeth. Compared to the other two pre-WWI designs, Conte di Cavour and Caio Duilio, she is a much more powerful ship. She was faster, better armed, better protected(with poor deck protection as most pre-Jutland designs) and with a good anti aircraft armament(for pre-WWI standards). Four ships of this class were planned: Caracciolo, Colombo, Colonna and Morosini. Of this four only the lead ship was launched but never completed. It was planned to convert Caracciolo to a carrier but that conversion never happened. She was then scrapped in 1921. Due to the lack of historical refits and modernization some “what-if” elements will be required. The biggest changes should be on deck armor, secondary armament(the primary is fine) and AAA, just like in Conte di Cavour and Caio Duilio with their modernization. I may think about plausible changes but it’s not a priority. The Littorio-class is the most powerful battleship ever built in Italy. Develop in the early ’30s, around the same time of the reconstruction of Conte di Cavour and Giulio Cesare, as an answer to the Dunkerque-class battlecruisers made by the French. Compared to the contemporary reconstruction of the Conte di Cavour-class was whole new story: better armed, with the newest 381/50, better protected, faster and with a good anti aircraft armament(for an early ’30s project). The trade off was the displacement: the actual standard displacement was over 40000 tons while the value on paper was 35000 tons(to stay within the Washington Treaty limitations). Four ships were planned, in two badges: Littorio, Vittorio Veneto, Roma and Impero. The differences between the two badges are relatively minimal and focused primarily on increasing sea worthiness. Littorio and Vittorio Veneto were built before WWII(they were in training when Italy declared war) and fought in most of the largest engagements with the British. Both were damaged multiple times but both survived and surrendered to the British after the Armistice. They were interned in Egypt and then scrapped after WWII. Roma was built in 1942 and saw little action during WWII. She is most known due to how she sank on 9/9/1943(due to two Fritz-X bombs). Impero was still incomplete during the Armistice. Captured by the Germans, bombed by the Allies and then scrapped after WWII. It was planned a carrier conversion for this ship although it was still in the planning phase. UP.41 was a project made by Ansaldo, originally for the Soviet Union(which eventually chose to go for Project 23 as their new battleship). This design had supporters also in Italy: one of them was Admiral Pini(which ordered the construction of a dry dock at Taranto specifically design to build and maintain this ship). She was short lived in Italy due to the firm opposition of Admiral Cavagnari(at that time the commander in chief of the Regia Marina) and the project was abandoned. I wonder if that unique torpedo protection system the Littorio had would lessen its chances of being holed by fish if she’s to be statted in-game. The UP41 was sold to Soviet Union (along with an elusive BC design, possibly a old 1933 one and other designs) only after Admiral Cavagnari in 1936 decided for two more Vittorio Veneto units (RN Roma and RN Impero) in place of more powerful but also more difficult to get in line units (the 406mm for example would had been a entirely new challenge). Works for a new drydock in Taranto able to host UP41 type units were halted only in 1941. Yes, I have Vasiliev’s book. The amazing thing is that the Pugliese system was NOT included in the UP41 design, but the Soviets managed to get it anyway :D.
Caracciolo would be overpowered at Tier 6, makes little sense to me. T10: (Missing) Possibly the Soviet version of the UP 41 with either 12 x 16” Guns or the more popular 9 x 18” guns. Whichever is not picked would go to the Soviet BB tree as a T10 probably.